” Hi again, I just wanted to let you know that all this week I have been having conferences with parents of my students at UWC. 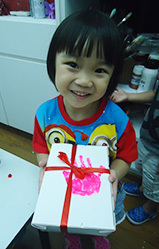 It is amazing how many have mentioned that their children have attended or still attend Little Artists Studio. They all speak so highly of your school Shalini. If the parents ask where their children can do extra art classes I always mention you. ” Hi Shalini I hope this email finds you well. My husband and I have been meaning to have a chat with you personally but we have not had the chance. As you know Mithalina has been accepted into SOTA and been offered the David Marshall Scholarship that will subsidise part of her 6-year study there. We are very happy for her and she is ecstatic. We would like to express our thanks to you and your dedicated team of teachers who have managed to uncover and hone Mithalina’s talent and further develop her potential to this end. Thanks especially must go to you during the period nearing the interview sessions for all the training and encouragement you provided for her so as to increase her confidence. She shared with me that your sessions did wonders for her morale and self-esteem. She felt that she did very well for her interview as a result of all the preparation. “Kavya loves to go to art class at Little Artists. She went as little as 5 year old with a love to colour & paint. At the age of 11, she is doing wonderful work which we proudly display on the walls of our living room. I have kept all her work over the years and the development is obvious. 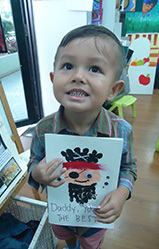 The Little Artists team is very professional and create a good atmosphere for kids to learn and nurture art. I have and will continue to recommend the class to my friends. “We are indebted to Shalini for making our kids – Nikita & Kareena realize their potential as budding artists (at least a very good start!). Although this institution is called ‘Little Artists’ and the lady herself is ‘little’, her qualities and charm as a teacher is anything but that!. I can’t imagine anyone else being so patient and caring in bringing out the very best of budding maestros. After 10 years at Little Artists, my little daughters are now proud pupils of an amazing artist and most genuine human being. Shalini has set them well, with a head start in their voyage of discovery of the pleasures of art and we will remain grateful to her for all our lives for that. Every child needs something as a hobby that he/she can excel at and enjoy/immerse himself/herself in. I am so glad that thanks to Shalini my kids found art as the activity for themselves. “Good to see is fine motor skills improving. His sense of colour is vibrant. I hope the teacher will be supportive and constructive. “Yes I am really happy with what he is learning and at the same time he is having fun. Teacher Moe is very sweet and has a way around the kids. Vedang is very fond of her. He would like to do clay projects more often with drawing. “Yes, the enjoy the classes. I see that Samyukta seems more influenced by the lessons even when she is at home. I don’t see the same level of interest in Adya, however.